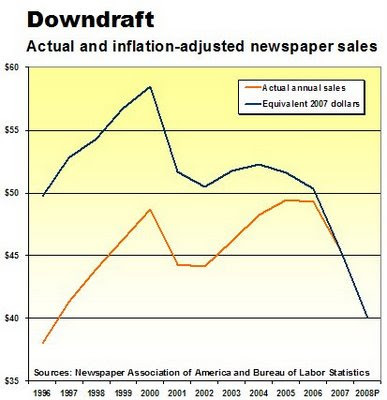 Newspaper advertising sales this year are on track to fall some $5.5 billion to less than $40 billion, which would make for the lowest volume since 1996. Based on the record $3 billion drop in sales in the first six months of this year, it appears that the industry’s combined print and online revenues will come in at $39.9 billion. The last time annual sales were below $40 billion was in 1996, when the industry took in $38 billion in revenues. Adjusted for inflation, the 1996 sales are equal to $49.8 billion in 2007 dollars. Thus, it could be argued that the industry’s projected revenues for this year will be nearly 20% lower than they were a dozen years ago. The sales forecast for 2008 is based on the assumption that the uindustry will produce 47% of its revenues in the first six months of the year, as it has done on average in the last five years. Unforeseen events – good or bad – could affect the actual outcome.